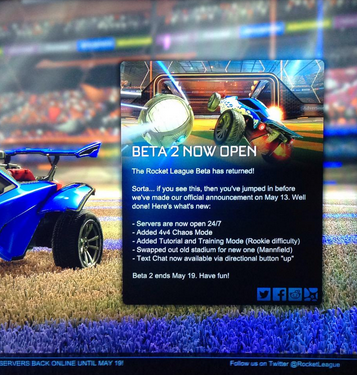 May 12, 2015 May 21, 2015 andrewComments Off on Rocket League – 2nd Beta Now In Motion! Rocket League, the intensely fun soccer/rc car mashup game is back in beta. Part 2 of the beta officially goes live May 13th, but it updated on my PS4 last night. (Thanks to TheHugofWar, who brought it to my attention.) The game has updated and there are visible improvements in the grass textures, and smoke effects on the vehicle’s exhaust. I have noticed a bit more lag/motion issues here and there, but nothing that’s made the game less fun to play. I’m sure it has to do with some of the optimizations and adjustments they’ve made, and this will give them another round of support to make even more improvements. Have suggestions? Check out the Rocket League Forums! – The arena has been changed to a new one. It’s mostly the same shape but slightly less rounded, and the ceiling seems higher (could just be an optical illusion). Noticable adjustments to background assets as well. Nice overall improvement. – 4v4 Mode is now available. It’s even more intense than 3v3 and within the new arena it seems like there is constant action, which makes goals even more exciting to watch on replay. – There is a tutorial and training mode, though I haven’t checked them out yet. – Servers are up 24/7! This is AWESOME. No more waiting around for server activity or dealing with lag from the EU servers (or US servers if you’re in the EU). This beta ends May 19th, and if you already had Rocket League on your console then all you need to do is make sure the update applied (it was under 600MB) and you’re good to go. I’ve already talked about my opinions of the initial beta here, and I am glad to see the beta back so soon. Playing already? Tweet us and let us know!